The respondents were a mix of travel agents, airlines, hotel groups and more, and gave their views on trends in customer experience, data, mobile and personalisation. Let’s take a look at some of the key insights from the report. Digital analytics also came in high at 23%, suggesting that the need to understand customer behaviour in this sector is strong amongst its marketers. Q: In the context of your digital strategy, in what areas is your organisation most lacking skills and capabilities? As data becomes more plentiful it is becoming increasingly difficult to turn it into actionable information, which explains why those two skills appear so high in the above list. As for programmatic, it is largely data-driven, so again it is not surprising to see it ranked highly with other data-related skills. 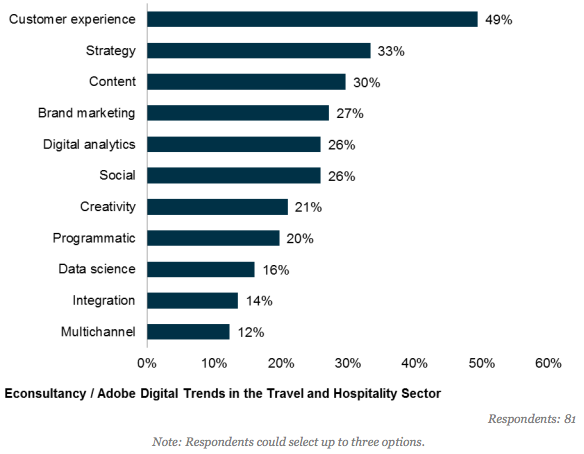 While the above figures relate to skills in which travel and hospitality brands are most lacking, in terms of the most important skills to develop in future it is customer experience that comes out top. 49% of respondents cited customer experience as one of the top three most-important capabilities to develop over the next 12 months. Q: In the context of your digital strategy, in what areas will it be most important to develop capabilities over the next 12 months? As you can see from the chart above, customer experience came out far ahead of the second most-cited capability. But strategy and content, with 33% and 30% respectively, are also seen as significantly important skills to develop in the coming year. What is most surprising about the second chart is the fact that data science and programmatic scored relatively low given that they appeared so high up on the first chart in this post. 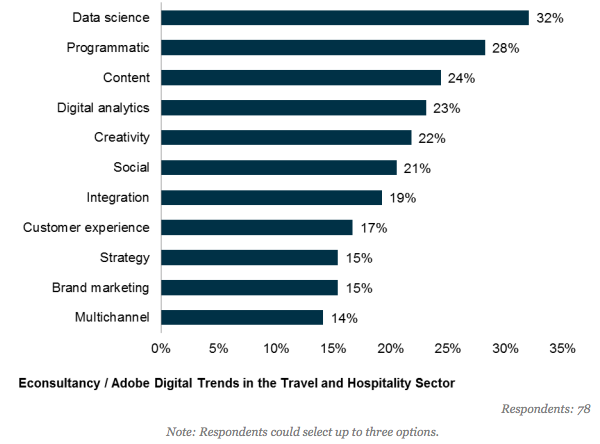 This suggests that while travel and hospitality brands might not be strong when it comes to data-driven marketing, this isn’t necessarily because they’ve tried and failed to acquire this capability. Instead, it seems they simply don’t view those skill areas as important. And it is possible that they’re spending limited time and resource on the high-scoring skills in the second chart instead. This theory seems even more plausible when you take into account that both customer experience and strategy scored low on the first chart. It seems that content is the only area where the lack of capability matches up with its perceived importance in the coming year, suggesting that while travel and hospitality brands are keen to produce quality content they’re still struggling to get the best out of this relatively new and rapidly growing channel. Download the full report for lots more insight.